The University of Florida Bookstore is your official location to order your cap & gown for participating in UF's commencement ceremonies. If you are registered to graduate with UF for the current term, currently Spring 2019, you can log into Gator 1 Central and order your cap & gown online. To be eligible to order a cap & gown for participating in UF's commencement ceremonies, you must be registered to graduate for the current term. If you have registered, when you log into Gator 1 Central you will be informed that you are eligible to order a cap & gown. If you did not register to graduate for the current term, but should have, you will need to read and complete a late degree application. You will be required to provide height and weight information to make sure that you receive the appropriate gown. You will also have an option to enter a phonetic spelling of your name to assist the commencement presenters with pronunciation. Doctoral candidates are required to have a hood for the ceremony. Doctoral candidates will have the option of renting a hood which will need to be returned with the gown or purchasing a hood that will be yours to keep. The deadline to order your cap & gown for the Spring 2019 term is Friday, March 1st 2019. All orders placed after this deadline will incur a late fee of $10.00. If you order your Cap & Gown but then find you will not be able to participate in the ceremony, the last day you can request a refund is April 19th 2019 by 5:00 P.M. Once a cap & gown has been picked up, you cannot receive a refund. Caps & gowns for the Spring 2019 term will be available for pickup beginning Monday, April 22nd through Monday, May 6th in the UF Bookstores located at 1900 Museum Rd, Gainesville FL 32611. These dates and location do not include the following degrees: DMD, DVM, JD, SJD, LLM, MD or MPA. To pick up your cap & gown, you will need to bring your Gator 1 Card or other photo ID. 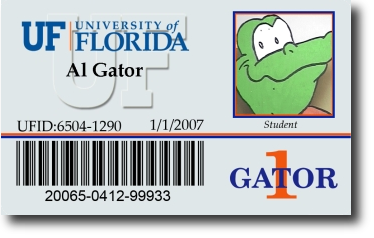 Someone else can pick up your cap & gown for you, but they must have your Gator 1 Card or photo ID to do so. Doctoral Cap & Gown orders, are rented and must be returned to the UF Bookstore at 1900 Museum Rd. After this date, cap & gown returns are subject to a late fee of $5.00 each day it is late. You keep the tam & tassel. Cap & Gown pickup begins on Monday, April 22nd at the UF Bookstore ‐ Lower Level. If you have any questions concerning ordering a cap & gown, please contact the UF Bookstore at (352) 392-0194 or email cap-gown@ufl.edu.